Once a month, from spring till fall, several miles of roadway are closed to traffic. Pedestrians, bicyclists and roller skaters are all encouraged to take to the street and traverse the length, often several miles. It's called Sunday Streets and yesterday was the 1st one of the year. Last year, we went to the Chinatown/North Beach Streets, which I blogged about here. But Jimmy was in Santa Clara all weekend for a conference so I was on my own to explore. 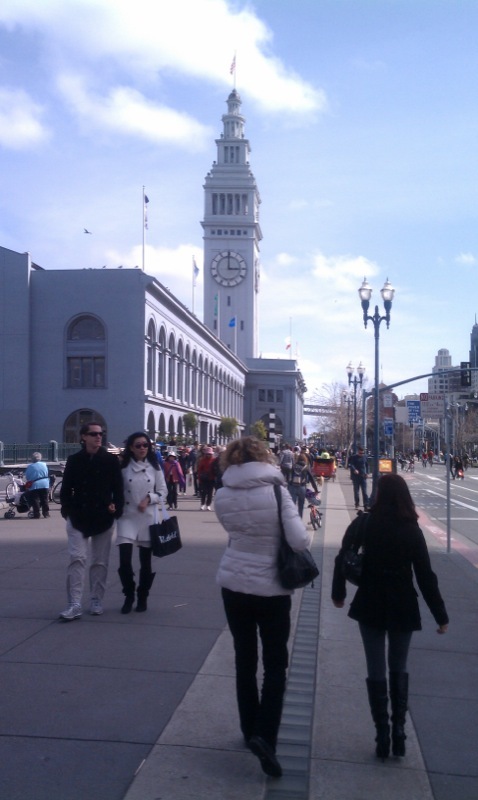 I took the bus up to Fisherman's Wharf and walked along to Embarcadero to the Ferry Building. Had some lunch then continued the walk home. Walking along the Embarcadero. The buildings on the left are commercial piers. All ferries to Alcatraz island leave from Pier 33. Near Fisherman's Wharf, some roller skaters were showing off their moves. Bicycle taxis were doing great business for people who were too tired to walk the entire length, or who walked one way and needed a lift back. The iconic Ferry Building, one of my favorite spots in the City. Next month on April 15th, the streets will be closed on the Great Highway and in Golden Gate Park. What a great walk - cities are such exciting places and interesting people watching! Such a healthy way to spend a day. Sounds marvellous, wish I could do this. Looks like it was chilly, I see people wearing winter jackets. You're really making me want to go back to your neck of the woods, Mad! Actually, just the other day Astrid was saying she wants to go to San Francisco...and spit off the Golden Gate Bridge. :) That's her thing. Ewww,,, spit off the GG Bridge??? Tell Astrid that's NASTY!